Since winning the Gold Medal at the 1986 Tchaikovsky Piano Competition in Moscow, Barry Douglas has established a major international career as a concert-pianist, as well as continuing to celebrate his Northern-Irish heritage. To this end, in September 2013 he recorded Celtic Reflections for Chandos, and has now followed this with a second collection for them – Celtic Airs. This comprises 18 tracks, which combine traditional Irish melodies like The Minstrel Boy with original pieces from composers like blind-harpist Turlough O’Carolan (1670-1738) and Seán Ó Riada (1931-1971), as well as numbers written by Douglas’s three co-performers here – Eimear McGeown, Catriona McKay and Chris Stout. The opening track appends three different titles together, creating a charming and atmospheric start to the disc. The traditional ornamentation from McGeown’s Irish flute, much by way of an effective and overall measured use of glissando, adds greatly to this. Douglas has arranged all the piano parts, and they just about manage to maintain overall interest, given the repetitive strophic nature of the air itself. While appreciating the need to keep such ‘arrangements’ essentially simple, perhaps just by gently tweaking the accompanying figuration along the way, and then taking it up the octave, Douglas hasn’t been overly inventive here, relying more on atmosphere than development. However, tempo and meter change to herald the second piece in the set – the eminently livelier Runescape Jig – though still in the same key. Once again the piano part is quite basic, and where variations do occur, these often involve merely doubling the naturally-quieter flute line, generally not considered an ideal practice. The Secret Circle Reel changes metre once more, though we’re still in the same key and, apart from some bottom-octave piano notes this time, not a great deal has changed yet. The solo flute at the start of the second track – Brendan’s Air – is really evocative, though the listener might well be forgiven for wondering whether they’ve somehow been transported thousands of miles away to the sound-world of Japan’s indigenous flute, the shakuhachi. Notwithstanding that, it’s still a most poignant and sentimental confection. The Foggy Dew initially finds Douglas at the bass-end of his instrument, in providing his backing to this familiar tune. In The Boatman the flute returns once more and the piano applies its subtle variants to each verse, preparing for a bolder finish. The Fields of Athenry start with piano-writing that hints at its contemporary origin, from the pen of Dubliner and folk-singer/songwriter Pete St John, before Douglas suddenly transfers the melody to the left hand and embellishes it with over-crossing right-hand arabesques that might have come straight from Chopin’s F major Study, from his Op 10 set, interestingly in the same key, too – a neat idea perhaps, but one that a Marc-André Hamelin or Stephen Hough might have done better. The piano opening of Planxty Irwin’ sounds a bit more encouraging, and perhaps it’ll lead to an opportunity to hear one of the other instrumentalists, but unfortunately not so, as the inevitable McGeown’s flute makes another, almost predictable appearance. The Minstrel Boy is, I think, one of the most endearing and successful tracks on the CD, where Douglas is simply playing the tune and accompanying it himself. Perhaps this might even have been the format of choice for the whole CD, as it seems to be what he does best, rather than having to coming up with inventive backgrounds to the solo instrument(s). The ensuing tracks continue in much the same vein – some familiar tunes, some not, some with piano only, and some with the flute again. In fact it’s only with Track 15 (out of 18) – Mná na hÉireann – that there is any real variety. A decidedly-promising piano opening gambit still introduces the flute first, but at least we do eventually get to hear Chris Stout’s Shetland fiddle some three-and-a-half minutes into the track. Stylistically, while its usage mirrors that of the flute earlier, there is now a welcome change of timbre, however short-lived. 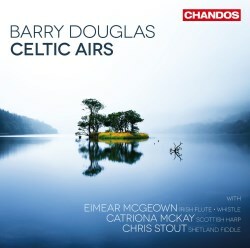 You fully appreciate the difference it makes to the following track – Barry’s Reels – where, in conjunction with Catriona McKay’s Scottish harp, it seeks to transforms all the earlier melancholy into the bright sunlight of a glorious summer’s day on The Emerald Isle – and, equally as important, it also allows the pure piano virtuosity of Douglas to shine through, too. Harp and fiddle remain to play in the penultimate number – Unst Bridal March – which returns the listener to the contemplative nature of the CD as a whole, but even here, Douglas’s arrangement often sees him now doubling the expressive line of the fiddle, as happened earlier with the flute. The final track – Óró ‘sé do bheatha abhaile – does ensure that the CD ends with a buzz. After all, unlike its predecessor, where the clue was in the title, ‘Reflections’, the present CD is all about ‘Airs’, and, by definition, they don’t all have to seem slow and mournful. McGeown’s move here from flute to whistle adds an extra perspective as the music whirls towards its inevitable, yet slightly unexpected conclusion. For me, it seems as if Chandos had a slight dilemma here. The CD features McGeown almost as much as it does Douglas, but the well-respected classical pianist adds so much more street cred, even if there’s nothing that mind-blowing about the piano arrangements themselves, perhaps to appeal to the wider audience, who may not necessarily be that au fait where exponents of Irish folk music are concerned. The CD cover doesn’t help here, either, as it would seem to imply that each of the three accompanying instrumentalists makes an equal contribution on disc, when this is patently not the case, since you have to go some fourteen tracks before harp and fiddle even get a look in. But this is still probably going to prove a popular CD on the easy-listening shelf, and if you’re particularly into things Celtic, then you’ll no doubt be hooked pretty quickly – and before you can say, ‘to be sure’.